Trump Hotels eyes massive expansion. That's a big problem. 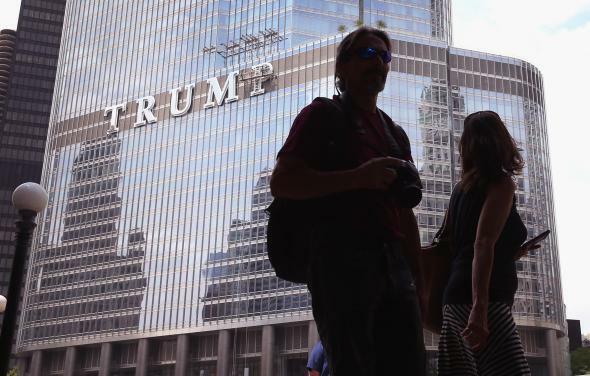 Workers install the final letter for a giant TRUMP sign on the outside of the Trump Tower in Chicago on June 12, 2014. The Trump Organization sounds like it has big plans for the next four years, beginning with a massive domestic expansion of its hotel-management company. Speaking at an industry conference this week, Trump Hotels CEO Eric Danziger suggested that he wants to see the company add more than 20 new hotels, which would roughly triple its existing portfolio. “There are 26 major metropolitan areas in the U.S., and we’re in five,” Danziger said Tuesday at the Americas Lodging Investment Summit in Los Angeles, according to Bloomberg. “I don’t see any reason that we couldn’t be in all of them eventually.” Eventually is the keyword there since Danziger does not appear to have given a specific timeline for the expansion, but a spokesperson for Trump Hotels confirmed to Slate that the company sees “significant growth opportunity in the United States” for both its Trump brand and its new, lower-priced Scion one. Those comments leave little doubt that the Trump-owned hotel company—and the Trump Organization—has no intention of standing down while its owner and namesake is in the White House. That will drive ethics watchdogs and the good-government crowd understandably crazy since they’ve already warned about the swirling mess of conflicts posed by Trump’s existing business interests, both at home and abroad. Those problems will only grow if the Trump family business—led by the president’s two adult sons—expands its footprint. Following the election, Donald Trump originally promised that his company would swear off any new deals, foreign or domestic, while he was in office. That pledge, however, got a rewrite earlier this year to allow for new deals inside the United States. Trump’s lawyers say that any new domestic deals will need to survive a “vigorous vetting process” conducted by a new ethics adviser and an internal compliance officer. That sounds great, sure, but they haven’t provided the specifics about what that process would entail or said whether it would be made public. Given what we’ve seen from Trump and his business to date, there’s little reason to believe it will be. According to separate reports on Wednesday, the Trump Organization has hired Bobby Burchfield, a longtime Republican lawyer who represented George W. Bush in the 2000 Florida recount, as the aforementioned ethics adviser, and George Sorial, who has represented the Trump Organization for the past decade, including in lawsuits against Trump University, as the chief compliance counsel. Both would presumably need to OK any future hotel expansions. But assuming they haven’t been granted set terms of employment by the company, both would have an incentive to give the green light since they could theoretically be fired if their oversight proves too costly to the company signing their paychecks. It is particularly hard to imagine Sorial, a longtime Trump employee, serving as an effective safeguard. Trump, meanwhile, has more or less ignored the entities that could provide actual independent oversight and input, like the Office of Government Ethics, which traditionally advises presidents on such matters. Trump Hotels currently manages more than a half-dozen Trump-branded hotels in the United States, some of which it owns outright and some of which it only manages. According to the Bloomberg report, Danziger suggested that the Trump name—typically reserved for its luxury hotels—would only be used for expansion in major metropolises like Dallas and San Francisco, while the company would use the new Scion brand for properties in smaller cities. But either way, President Trump won’t exactly have to go out of his way to find them. Even if the president follows through on his promise to stay out of his family business entirely, that promised firewall would still have plenty of holes in it. State and city officials who would need to sign off on construction permits, environmental reviews, and other paperwork will know that President Trump will almost certainly be aware of how that process plays out. And it’d be a similar situation for any other company that gets involved in construction and needs to negotiate with Trump execs. Given that, it remains an unavoidable reality that anyone doing business with the Trump Organization during the next four years will also be doing business with President Trump. Donald Trump Is Being Sued for Violating the Constitution. Here’s What You Need to Know. Trump Promised to Do Five Things to Separate Himself From His Business. There’s a Glaring Problem With Each.